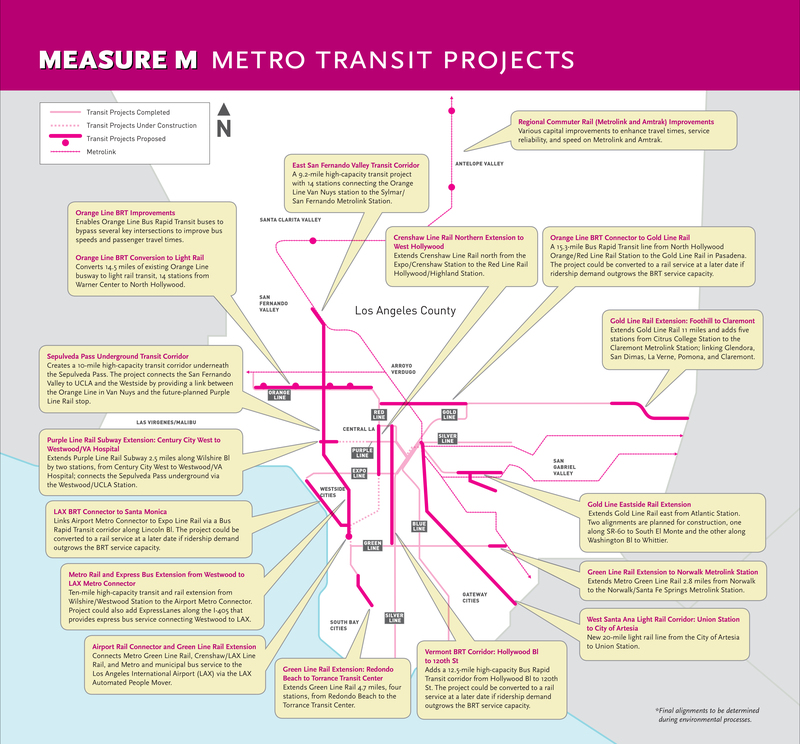 Prop C provides funding to critical transportation projects and programs, including services to help stranded motorists on freeways, bus and rail improvements and carpool lanes. Proposition C funds are allocated to a variety of capital and operating projects and programs that improve transit service and operations, reduce traffic congestion, improve air quality, and efficiently operate and improve the condition of streets and freeways utilized by transit. Prop C was approved by Los Angeles County voters in November 1990 with revenues generated by a half-cent sales tax. By ordinance, revenues from Proposition C are allocated into categories including Rail & Bus Security; Commuter Rail, Transit Centers, and Park and Ride Lots; Local Return; and, Transit Related Improvements to Streets and Highways. Prop C was intended to support projects and programs developed with Prop A funds and, in particular, was to provide funding to help improve and expand the rail system started with Prop A funds. The Metro Freeway Service Patrol (MFSP). Formed in 1991, this service provides free assistance to motorists stranded for whatever reason on the County’s 450 miles of highways. The MFSP currently assists an average of 25,000 motorists each month, approximately 300,000 a year. Statistics show that on more than 70% of the assists made, the wait-time for tow truck service is less than five minutes. The MFSP operates 152 tow trucks jointly managed by Metro, the California Highway Patrol and the California Department of Transportation (CalTrans). Installation of the 296 “lane miles” of carpool – also known as HOV or High-Occupancy Vehicle – lanes currently accessible on the region’s highway grid. 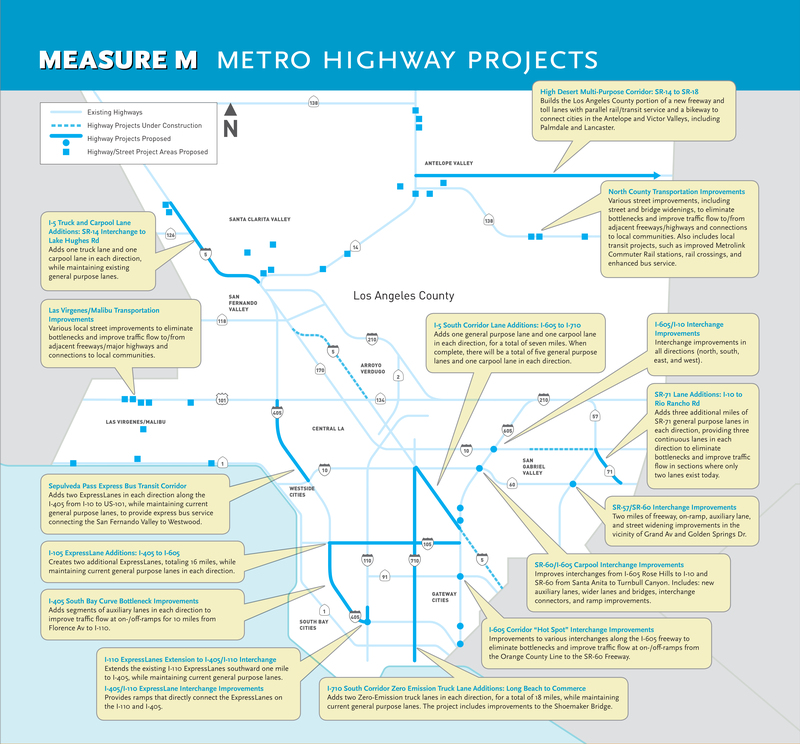 The most significant of these is the 7.8-mile carpool lane on the southbound I-405 (San Diego) Freeway, which connects the I-101 (Ventura) and West Los Angeles through the Sepulveda Pass. The I-405 carpool lane cost $22.7 million to construct with approximately 90% of the cost funded by Proposition C. Already operating the largest freeway carpool lane network in the nation, Metro now has an additional 51 lane miles under construction, 104 lane miles in design and 197 lane miles in the planning phase. Creation of the first-of-its-kind Regional Transit Pass Program in Los Angeles County. In the summer of 2002, Metro instituted the new EZ-Pass, which gave transit riders the option of unlimited travel using a monthly regional pass on the Metro Bus and Rail systems and on the fixed route bus networks of 11 regional municipal bus operators. The program was instituted to create a “common currency” among the region’s transit operators and help alleviate the frustration of riders compelled to carry extra cash or purchase additional transit passes.